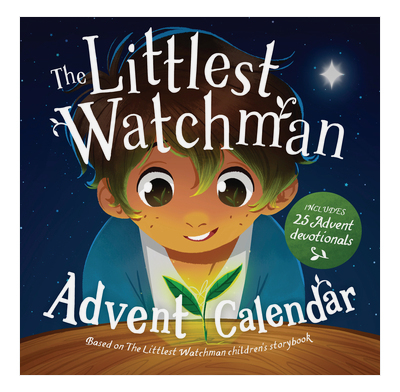 Full-color, engaging Advent Calendar linked with The Littlest Watchman storybook. Includes 25 family devotionals. Each window in the Advent Calendar opens to reveal a rich, full-color illustration of the events of the first Christmas and tears off to allow you to make your very own "Jesse tree" Christmas decoration. Children will love meeting the different people from Jesus’ family tree and taking part in the craft activity. • The Advent Calendar has 25 windows, which open to reveal the events of the first Christmas. • The calendar windows can be torn off and hung on a simple version of Jesus' family tree known as a "Jesse tree". • The accompanying 32-page booklet gives outlines for a daily family Bible time during Advent. 8.7" x 8.7" x 0"
This pack contains an Advent Calendar that is 210 x 210 mm (8.25 x 8.25 inches). The calendar unfolds to be free-standing. The accompanying devotional booklet is 148 x 148 mm (5.8 x 5.8 inches). This was really good to go through each morning over breakfast as a family. I'd recommend longer than the 10 minutes each day we took to get the most out of this and encourage conversation etc, but it was still good. Our children are also 2 1/2 and 3 1/2 and quite a lot of it went over their heads, but some stuck, and we found them repeating or asking about throughout the Advent season. I'm hoping to do this again next year with them both, and be a little more prepared for it - perhaps by getting The Littlest Watchman book!